Trump didn’t specify the timeframe in which 3.5 million Americans were lifted off SNAP benefits in his remarks Friday, but he has previously cited a decline in food stamp enrollment using the November 2016 election as the starting point. 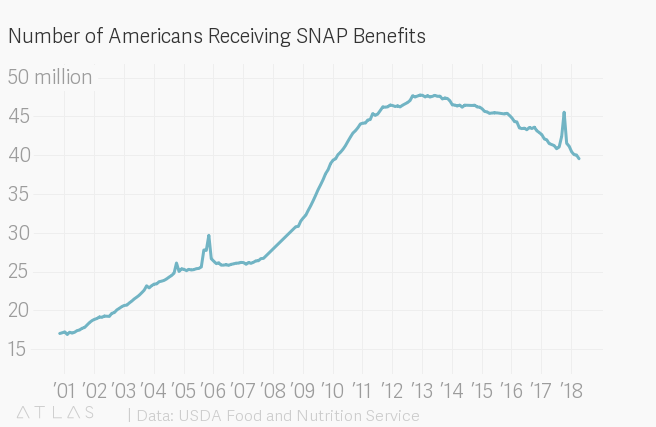 Under Obama, the number of people receiving SNAP benefits peaked at about 47.8 million in December 2012 following increased enrollment during and after the Great Recession. By November 2016, there were 43.2 million people on SNAP – a decline of about 4.6 million. The left-leaning Center on Budget and Policy Priorities (CBPP) estimated that at least half a million individuals lost SNAP benefits in 2016 because the waivers expired. Trump’s Fiscal Year 2019 budget proposed implementing stricter work requirements for SNAP beneficiaries, a 30 percent cut in SNAP funding over the next decade and restructuring the program so that many recipients receive boxes of non-perishable food rather than using SNAP funds to buy food at their local grocery store.